After a journey lasting nine and a half years, NASA's New Horizons spacecraft finally reached the distant world of Pluto. The 3-billion-mile (4.8 billion kilometers) expedition culminated with New Horizons sweeping a mere 7,800 miles (12,500 km) above Pluto's surface. During the probe's flyby last month, it obtained a treasure trove of scientific data snapping — by far — the most detailed photographs ever taken of this mysterious object and its several moons. In those pictures, instead of a cratered, barren orb, as some scientists had expected, Pluto appears to be a startlingly dynamic world with soaring mountains and smooth plains of exotic ices. "The outer solar system is not a cold, barren 'dead zone'," MIT's Richard Binzel, a co-investigator on the New Horizons mission, told The Kavli Foundation after the flyby. 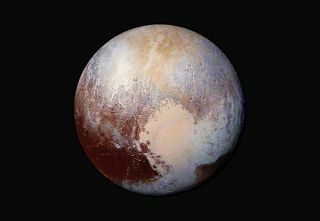 "Active processes must be occurring on Pluto to give that diverse range of features. We have a lot of new mysteries to solve." On Aug. 26 at 3:30 p.m. EST, join New Horizons team members Binzel and Cathy Olkin, of the Southwest Research Institute, along with Kavli Prize laureate Michael Brown, from the California Institute of Technology, for a live webcast hosted by The Kavli Foundation. These planetary scientists will your answer questions about New Horizons' voyage to Pluto and what this strange new world may have to teach about the other bodies at the solar system's fringes. HOW TO SUBMIT QUESTIONS: Questions can be submitted ahead of and during this webcast by email to info@kavlifoundation.org or by using the hashtag #KavliLive on Google+ or Twitter. From left to right, Richard Binzel, Mike Brown, Cathy Olkin and Adam Hadhazy will participate in a Google Hangout about Pluto on August 26, 2015. Richard Binzel — Richard Binzel is a professor in the Department of Earth, Atmosphere and Planetary Sciences the Massachusetts Institute of Technology and a member of the MIT Kavli Institute for Astrophysics and Space Research (MKI). He is a co-investigator on the New Horizons missions and has studied the Pluto-Charon system for 35 years. Michael Brown — Michael Brown is a planetary astronomy professor at the California Institute of Technology. His research specialty is the discovery and study of bodies at the edge of the solar system. Cathy Olkin — Cathy Olkin is a principal scientist at the Southwest Research Institute (SWRI) and a deputy project scientist for the New Horizons mission. Her planetary science interests include the study of the icy surfaces and tenuous atmospheres of outer solar system worlds. Adam Hadhazy — Adam Hadhazy is a freelance science writer who chiefly covers astrophysics and astrobiology. He has a master's degree in science journalism from New York University. To participate, visit The Kavli Foundation website.